For you back pocket, Zf Fashions brings a stylish collection of men wallet. People are using wallet for centuries and the trend will not go for centuries to come. The basic design of the wallet, for instance, credit card slots, clear spots for photo ID, etc. ; is here to stay. 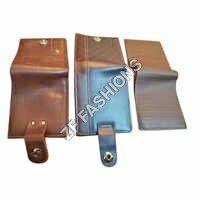 If you want a firm wallet, that will last for years, even after being used and abused on daily basis; then opt for this men leather wallet. These wallet presented by ZF Fashions are all hand made. The craftsmen make use of small tools, leather fabric and his skills to bring a stunning collection. The basic tools used are scissor, razor blade, straight rule, awl, stitching needles, etc. They first create a paper pattern and using this pattern they cut the leather into different parts of the wallet. These parts are numbered and then assembled together. These wallets are made with attention to detail and pride.